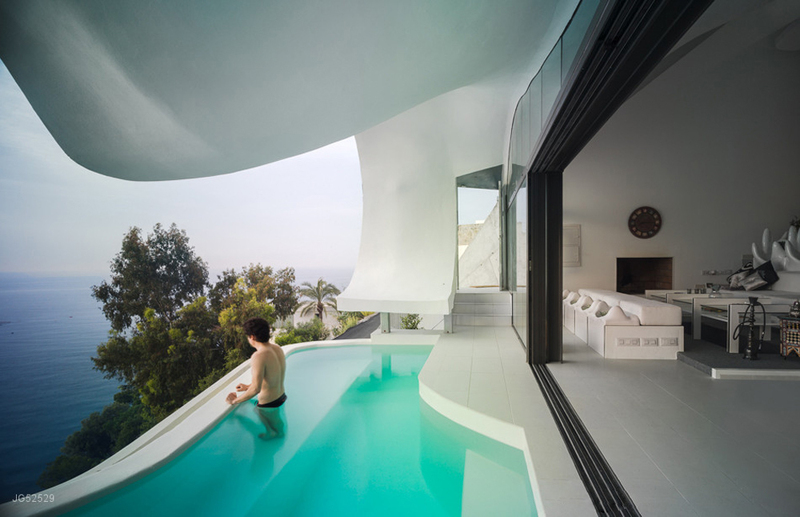 Gilbartolome Architects presented a beautiful and innovative house located in the Costa de Granada, on a cliff overlooking the sea. 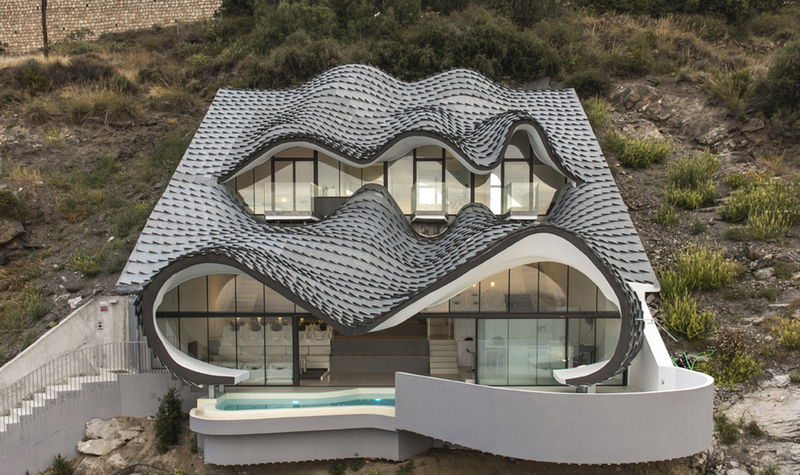 Pablo Gil and Jaime Bartholomew have designed the house, which is situated on a hillside overlooking the Mediterranean Sea and is the result of a private commission. 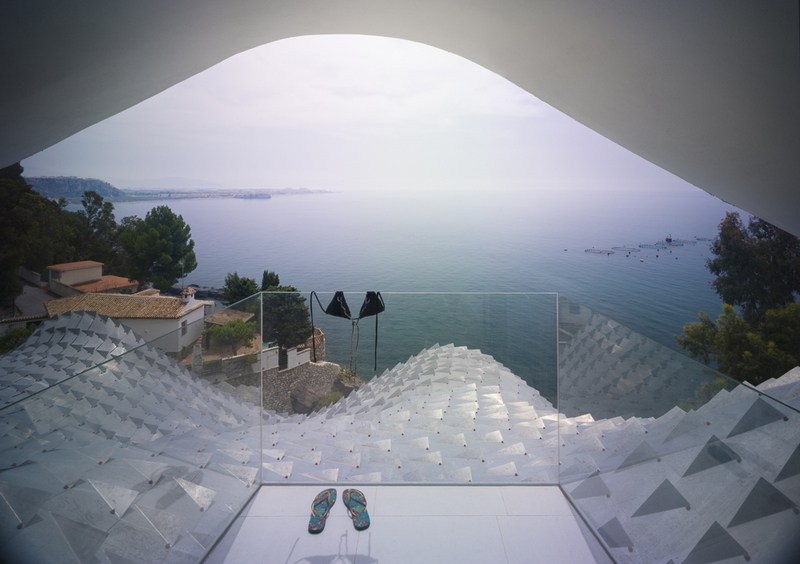 The designers had to come up with an innovative idea to take advantage of the breathtaking views of the plot that sits on the cliff at a 42° angle. 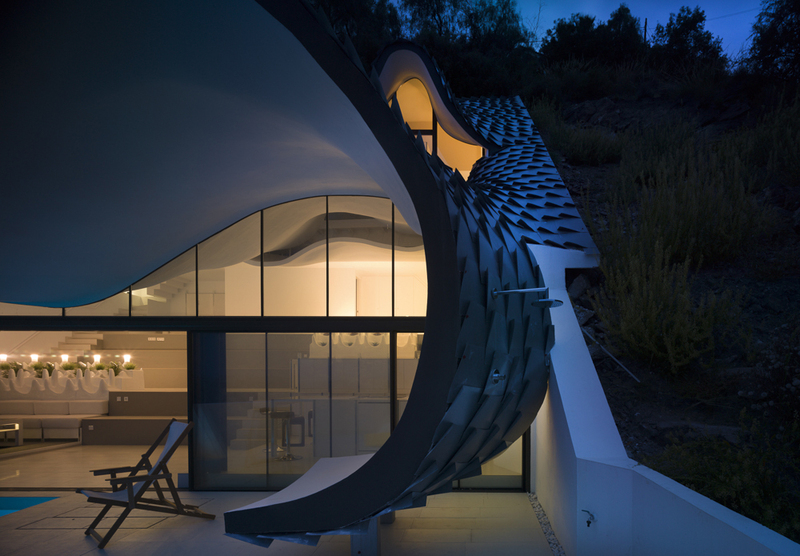 This house has two complex elements that have been economically viable thanks to the technique: the cover, made CONUN system very efficient artisan formwork deformable metal mesh, which is manufactured at a much lower cost compared to the options that are commonly used in construction (shuttering wood or steel structure), and covered with scales of zinc, which have been handcrafted made from material coils and placed on battens, reducing costing compared to prefabricated systems offered by the industry covered and installers. 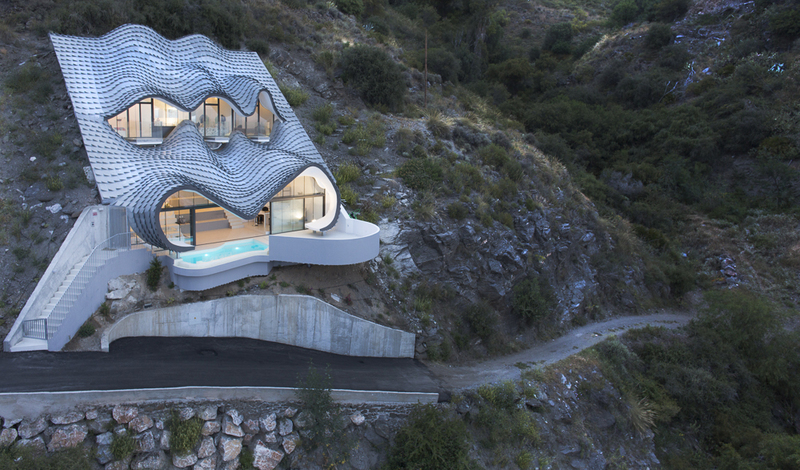 The house is on two floors, a large terraced hall, along the mountainside, attached to a cantilevered terrace with swimming pool, and a second floor with rooms that have flown viewpoints. 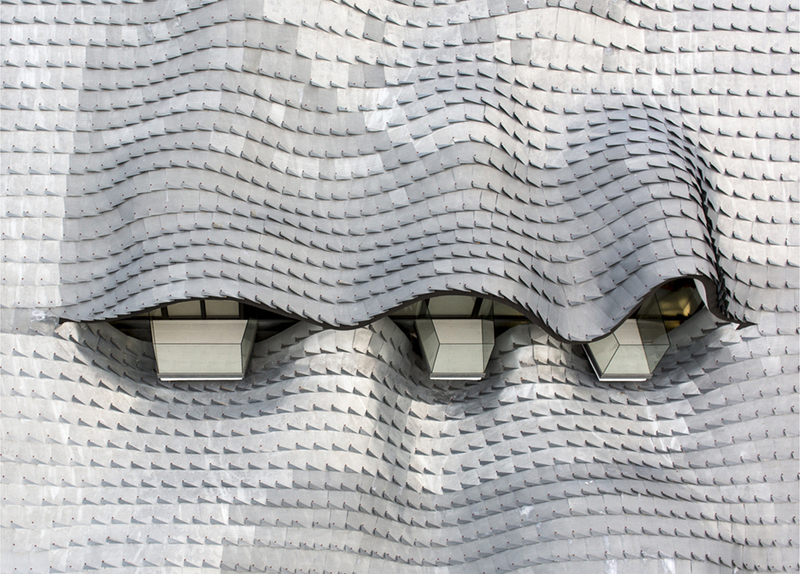 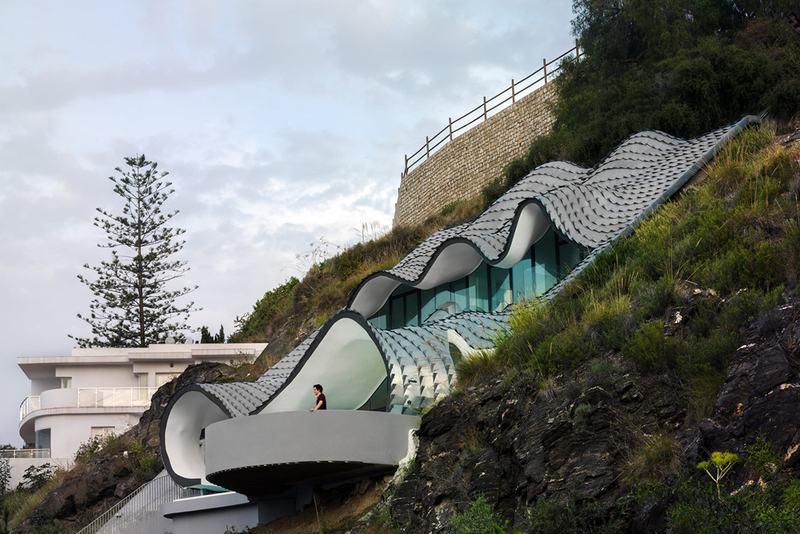 It is covered by a curved sheet of reinforced concrete without intermediate supports playing with the geometry of the terrain and, thanks to the zinc flakes that cover produce a calculated ambiguity between natural and artificial, between the skin of a dragon writhing, from above it seems to reproduce the color and foam of the waves of the sea, and from below seems to continue the natural slope, but with a contrasting materiality. 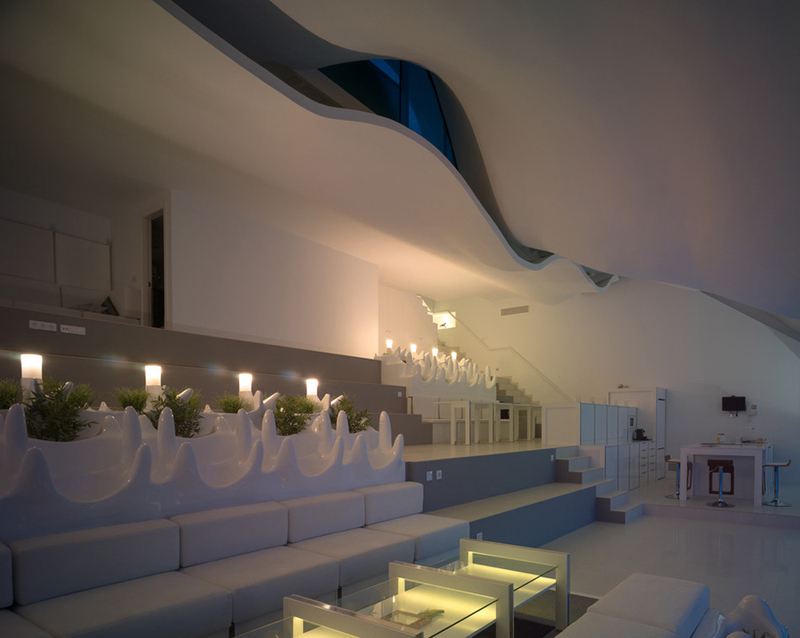 This cover allows the creation of a large home theater, a diaphanous ground floor of 150 m2 which can be made to work as an auditorium for 70 people, host large parties or to combine the activities of various groups of people. 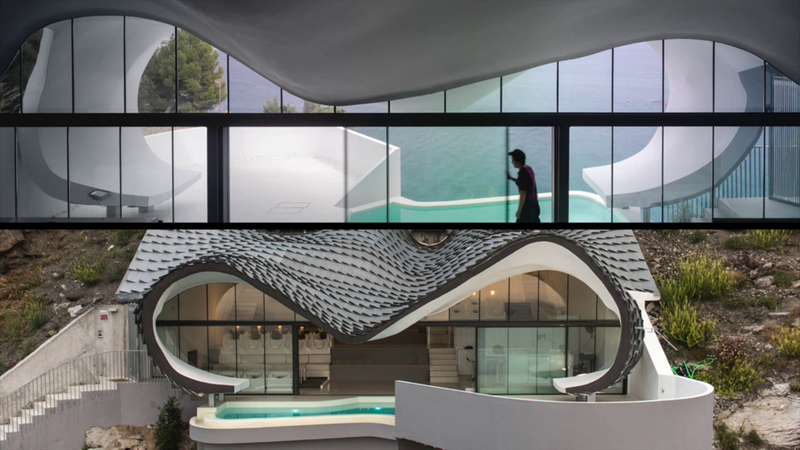 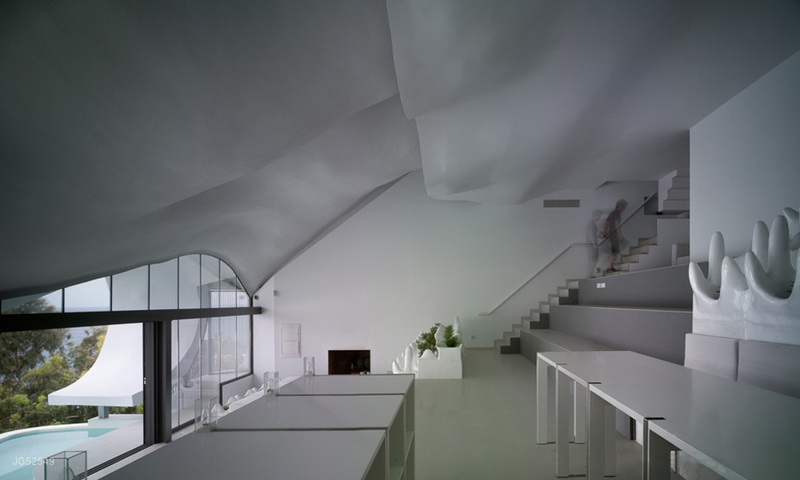 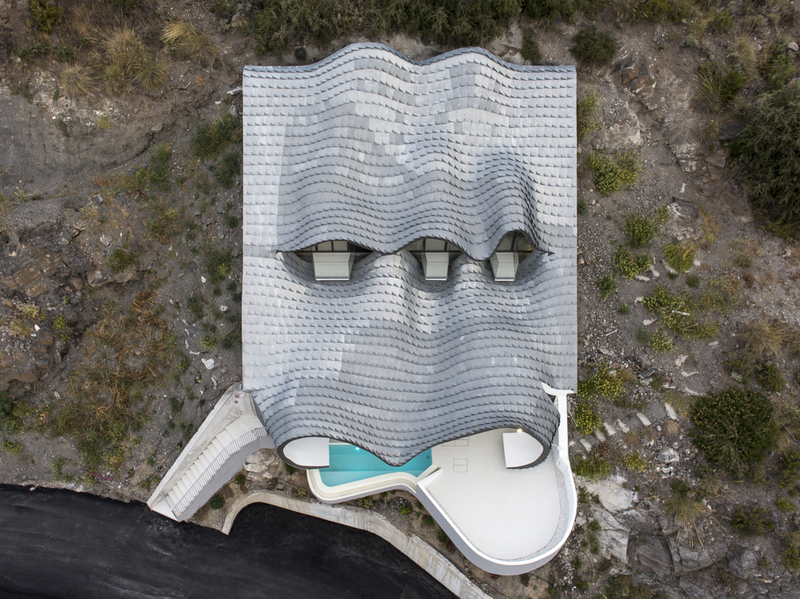 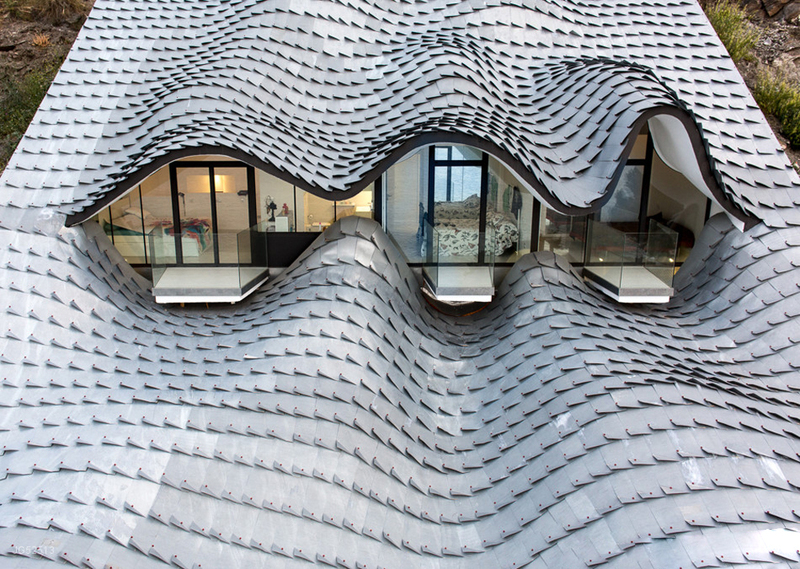 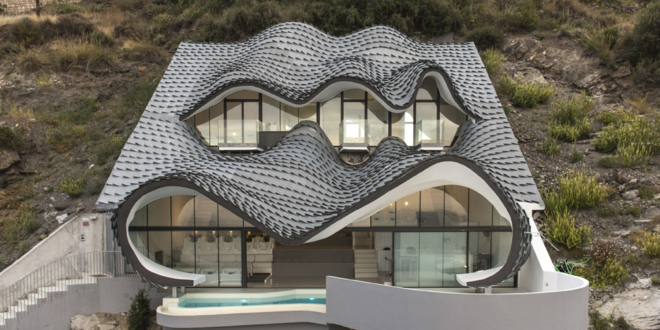 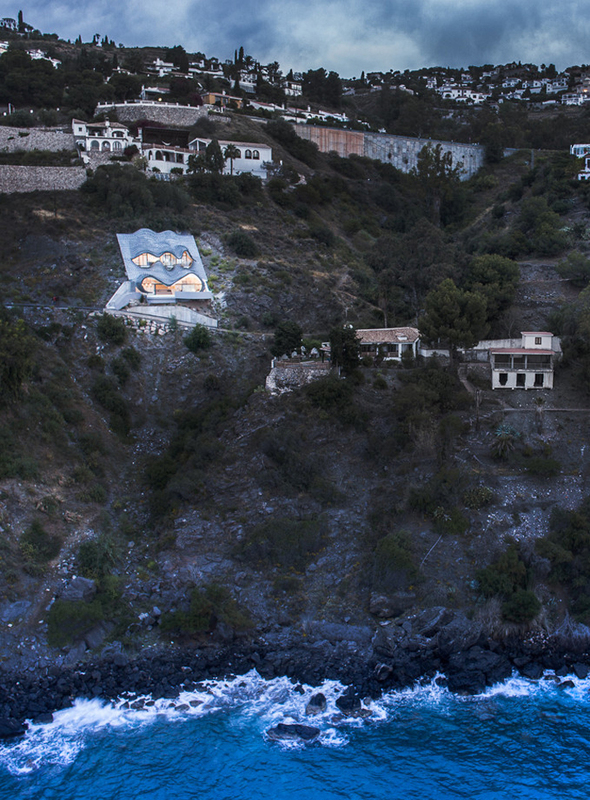 ‘The form of the house and the metallic roof produces a calculated aesthetic ambiguity between the natural and the artificial, between the skin of a dragon set in the ground, when seen from below, and the waves of the sea, when seen from above.’ – Pablo Gil and Jaime Bartolomé, Gilbartolomé Architects.